My whole life, I have had a certain love for Fall/Halloween Season. Not because of the cooler weather. Last year (no wonder I gained so much weight?) 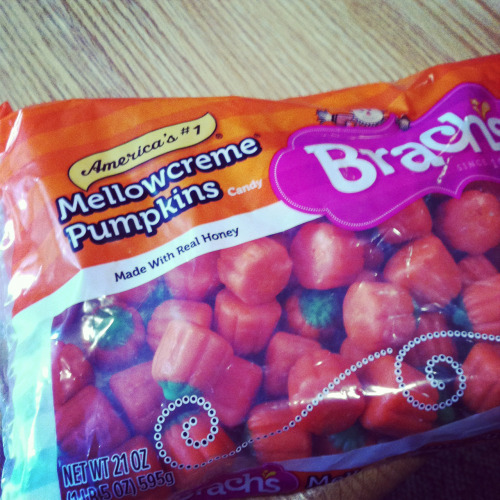 I would go to the store a couple times a week and buy a few bags of these...only to demolish them within a day or two! I have been very proud of myself, because I have NOT bought ANY candy corn this year. If I bought even a little, I would eat it ALL. But. of course, temptation finds us. We had a Halloween Party for the kids at my work, and we have a HUGE bag of candy corn leftover. WORST OF ALL ITS ALREADY OPEN! For any recovering sugar/food addicts like me, you know this is a BAD situation. BUT TODAY I ATE A TON OF CANDY CORN! I guess I had to cave at some point! I don't feel AWFUL about it, just mad that I broke my 2012 No Candy Corn Streak! Do you have any Holiday Treats that are harder for you to say no to? I've never had candy corn (I don't think we even get it here) but it sounds pretty tempting. Hope you had an awesome Halloween!